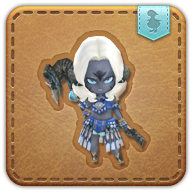 Summon your wind-up Sadu minion. Will most likely not call any of your companions a stunted chuluu. There once lived a young Dotharli warrior who dreamed of taking the khatun into his arms and, well, doing things that young Dotharli warriors dream of doing. He quickly realized he valued his life and instead crafted this less imposing stand-in.